The Buddha lived and taught in north-east India and about 2500 years ago. At that time writing was mainly used for business purposes, and so the Buddha's teaching were preserved by his disciples in an oral tradition. This led to many of them becoming structured in a stylised way to help people to remember them. Buddhist teachings (the Dharma) and monastic rules (the Vinaya) began to be written down about 300 years after the Buddha's death. These early teachings are preserved in Pāli (see below) and Chinese translations. The goal of Early Buddhism is often seen as gaining freedom from the suffering of painful and negative emotional states (samsara), to attain the blissful equanimity of Nibbāna - literally the 'blowing out' of the fires of greed, hatred and delusion. The Sanskrit equivalent of this word, Nirvāna, has become well known and has developed a meaning of its own in English and other languages. The saffron-robed monks of Sri Lanka, Thailand and Myanmar (Burma) are followers of Theravāda Buddhism, the only survivor of the early Buddhist schools. Their teachings are collected in the Pāli Canon, which has 38 volumes divided into 'Three Baskets': the monastic rules (Vinaya), the teachings of the Buddha and his disciples (Suttas) and the analytical texts of the Abhidhamma. 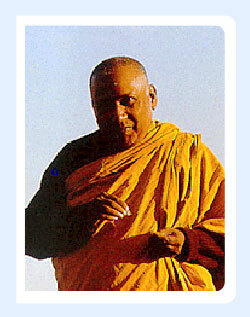 The Mahayana: The Great Way, developments a few hundred years after the Buddha's death.